The chrysanthemum, or fall ''mum'' for short, blooms in late summer and fall. Its flowers come in all colors except blue. Once in bloom, the mum will continue to flower for four to six weeks, depending on the cultivar, its location and its growing conditions. Deadheading regularly will produce the maximum period of flowering. Mums bring color to fall gardens. Mums come in many colors. Some of the many types of mums sport single, daisylike flowers, while others have semidouble or double flowers. Each flower is actually a cluster of tiny florets. The clusters are called heads. The heads bloom in many colors, including bronze, purple, pink, yellow, white and red. 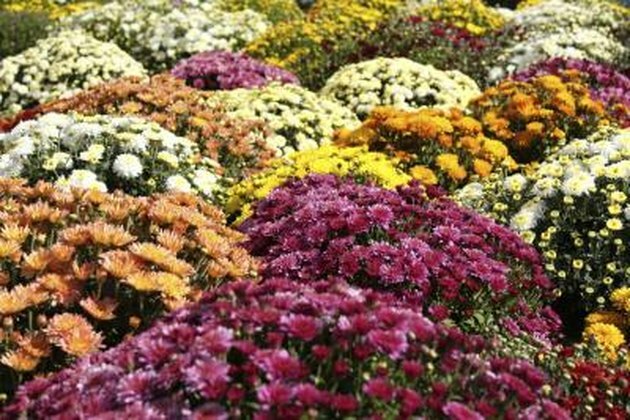 Mums are so widespread in the fall that they have become a symbol of autumn. Mums bloom throughout the fall. Mums range from 1-foot-tall cushion types to clumps that reach 2 feet or more. They require short days and long nights to bloom. The buds begin to form on the plant in mid- to late July. Different cultivars come into bloom at different times. 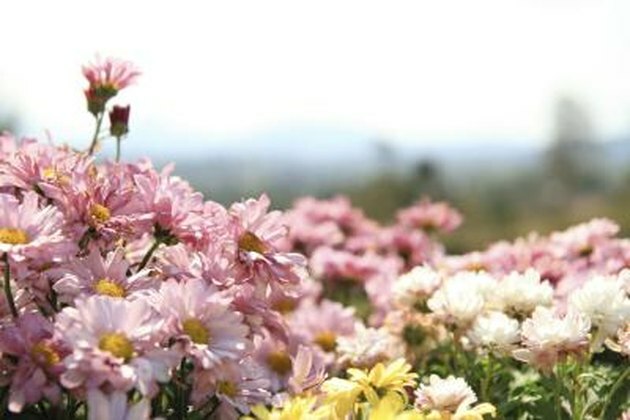 Some mums are early bloomers, while others are mid-season bloomers or late-blooming varieties. Early-blooming mums usually flower during the month of September. Mid-season mums bloom in late September through October. Late-blooming cultivars flower after mid-October. Mums may be planted with asters. Mums are a staple of the autumn garden. 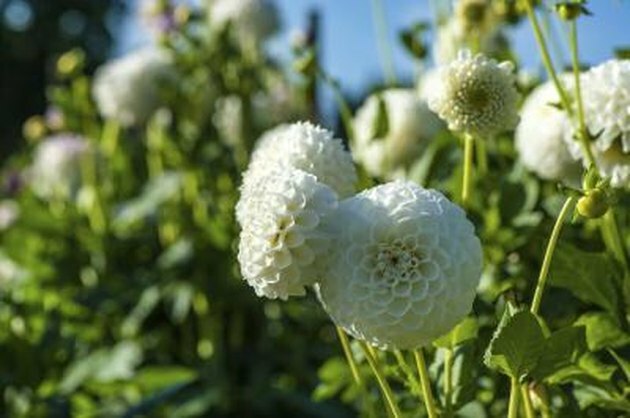 Though garden or hardy mums (C. morifolium) are perennials, they are often grown as annuals in pots, containers and window boxes. ''Taylor's Guide to Growing North America's Favorite Plants'' recommends growing them with other fall-blooming plants, such as asters, ornamental grasses and monkshoods. They also provide a bold splash of color when planted in masses in front of shrubs or hedges. Mums are easy to grow. Mums are fairly easy to grow. 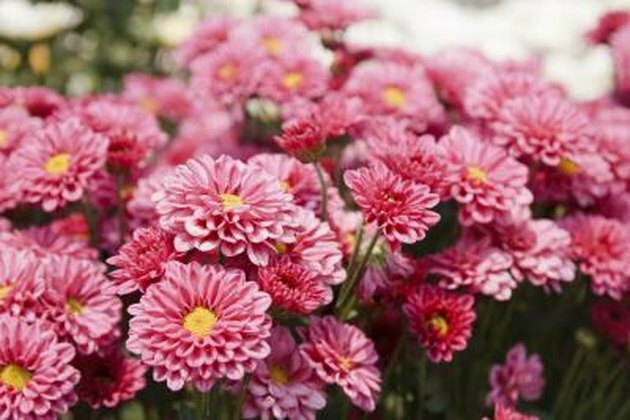 Hardy in U.S. Department of Agriculture zones 2 through 10, mums flower best in full sun or partial shade. Plant in spring and divide every two years. Space mums about 1 1/2 to 2 feet apart, allowing them room to fill out. Water plants regularly. Pinch the stems between mid-spring and midsummer to promote bushiness. Stop pinching the stems back after buds form, so as not to interfere with blooming. Karen Holcomb is a freelance writer who lives and works in Southwestern Ohio. She holds a Bachelor of Arts in English literature/journalism from Miami University, Oxford, Ohio, and has written professionally for over 27 years. Her work has appeared in Cincinnati-area newspapers, state and regional publications and the Congressional Record.